Let's spend some time together to talk about my favorite chocolate in the history of the world - the chocolate from Cacao Lorenzo. It is straight up amazing and I am obsessed. In fact, I've been obsessed for a while, which is a rarity for me. Here's a review I wrote of the place back in 2005 on the review site "Judy's Book" and it's actually quoted on Cacao Lorenzo's website as well! Words cannot describe this chocolate. To describe this chocolate would be an art. One cannot write what this chocolate is about without having music flow through the words. Ahahahahah Ok I am done. But in all honesty. The bar has been raised. This is by far the fanciest chocolate I have ever eaten, and I am not being facetious when I say I can picture the Mayans nodding approvingly. The lovely owner makes all the chocolates himself and is very friendly and open about what he does. The only drawback is that he doesn't sell individual chocolates so you must buy them in a box. BUT YOU WILL LOVE THEM SO IT DOESN'T MATTER. There is no need to sample here, this guy knows what he is doing. He also makes a different special everyday. On my birthday he made something called Frutti Fresco (or something like that) which was a small sliver of dark chocolate topped with some kind of milk chocolate paste, probably ganache, and then topped with two different berries. INCREDIBLE. I took the first bite and felt like I was transported to heavenly chocolate land where everything is good and delicious. I would also like to mention that normally I don't like dark chocolate, but I loved his. 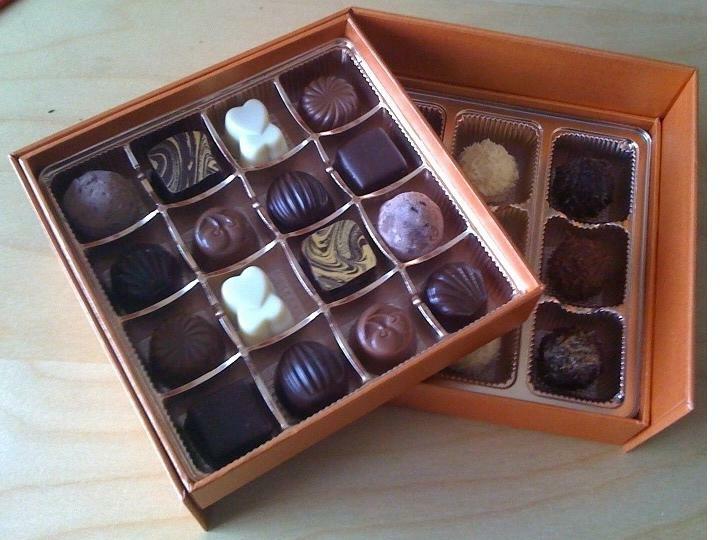 His regular box of chocolates has really unusual flavors that seem to work so wonderfully together. One of the chocolates is called India which is made with a spice that we actually use in Indian cooking - and it's yummy! Another is made with infused lavender and another is made with port soaked figs. Who is this guy? I think I need to be best friends with him because he amazes me. That’s right. I wrote that 5+ years ago and in that time I found out the guy was Larry McGlinchey, and he's the coolest and most awesome chocolatier ever, and yes, we're basically best friends :), I’ve discovered my love for dark chocolate, I’ve had the “India” chocolate as one of the favors for my wedding, and I am just as ridiculous hahahahahahaha. And I still love these chocolates. My favorite is definitely the Basque Square – port wine soaked figs, milk chocolate butter ganache, the Lavender Flower – lavender flower infused ganache, dark chocolate and the India - Spiced dark chocolate ganache. If you want to impress a loved one this Valentine's Day (click here for specials), or literally ANY DAY - get them a box of these chocolates. Swirl Wine Gift Certificate Winner! Swirl Wine Gift Certificate Giveaway! !